when you want to sign a PDF you have to download it, print it, sign it, scan it, and then e-mail it back. This can get pretty annoying if you’re doing all these steps often. That’s why having an app that can let you sign PDFs right from your Android device is very convenient. Step 1: Install SignMyPad on your Android device. Step 2: Open a PDF from your e-mail or downloaded files. 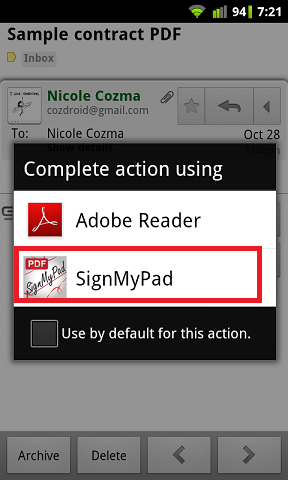 When opening PDFs from Gmail, just click Download and then use SignMyPad to open the PDF. Step 3: Click the Add button in the top right-hand corner and select signature from the pop-up list. Step 4: Sign your name in the box that pops up and click Done. Then drag your signature to the appropriate area of the PDF (scaling is done with the sliding bar). Step 5: Click the green check mark to complete the signature process, and then click the Menu button. Step 6: Save the PDF. You can keep the same name, or add “signed” to the title to save confusion. Step 7: In the next pop-up menu, you can choose between e-mail or Dropbox for sharing. Now you can return PDFs with a signature, from your Android device. Footy Scoreboard allows Australian football fans to get live scores for their favourite football code.